New Guinea, located just 100 miles north of Australia, is the world's second largest island after Greenland, having become separated from the Australian mainland when the area now known as the Torres Strait flooded around 5000 B.C.E. The name Papua has also been long-associated with the island. The western half of the island contains the Indonesian provinces of Papua and Papua Barat (formerly West Irian Jaya), while the eastern half forms the mainland of the independent country of Papua New Guinea. Papua New Guinea itself consists of the mainland and about 600 offshore islands, comprising a total land area of about 462,800 square kilometers. The highest peak between the Andes and the Himalayas, at 4,884 metres, Puncak Jaya (sometimes called Mount Carstenz) makes New Guinea the world's fourth highest landmass. It is also the highest mountain on an island on the planet, and perhaps the strongest candidate for highest point of the Australia/Oceania continent. 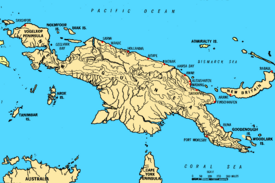 New Guinea is a large island located north of Australia, and south-east of Asia. It is part of the Australian Plate, known as Sahul, and once formed part of the super-continent Gondwana. The origin of most New Guinea fauna is closely linked to Australia. Gondwana began to break up 140 million years ago, and Sahul separated from Antarctica about 96 million years ago. As it drifted north, New Guinea moved into the tropics. Throughout New Guinea's geological history there have been many land connections with Australia. These have occurred during glaciations in various ice ages. Many occurred during the Pleistocene ice age (including the last glacial maximum about 18,000 years ago); the last of which was severed about 10,000 years ago due to rising sea levels that overflowed the lowlands. At this time, a number species existed on both land masses, and many plants and animals thus crossed from Australia to New Guinea and vice versa. Many later became isolated as the connection ended, further evolved to the new environment and became distinct species. Because the continent was more isolated than any other, very few outside species arrived to colonize, and unique native forms developed unimpeded. However, this Australia-New Guinea mixing occurred among relatively few faunal groups; some New Guinea species have an Asian origin. As New Guinea drifted north, it collided with the Pacific Plate as well as a number of oceanic islands. Although no land connection with Asia was ever formed, the proximity between the landmasses, via the many small islands of the Indonesian archipelago, allowed some Asian species to migrate to New Guinea. This has resulted in a unique mixture of Australian and Asian species, endemic to New Guinea. A central east-west mountain range dominates the geography of New Guinea, over 1,600 km in total length. The western half of the island contains the highest mountains in Oceania, rising to 4884 m high, and ensuring a steady supply of rain from the tropical atmosphere. The tree line is around 4,000 m elevation and the tallest peaks contain permanent equatorial glaciers—sadly disappearing due to a changing climate. Various other smaller mountain ranges occur both north and west of the central ranges. Except in high elevations, most areas possess a warm humid climate throughout the year, with some seasonal variation associated with the northeast monsoon season. The gardens of the New Guinea highlands are ancient, intensive permacultures, adapted to high population densities, very high rainfalls (as high as 400 inches per year (10,000 mm), earthquakes, hilly land, and occasional frost. Complex mulches, crop rotations and tillages are used in rotation on terraces with complex irrigation systems. A unique feature of New Guinea permaculture is the silviculture of Casuarina oligodon, a tall, sturdy native ironwood tree, suited to use for timber and fuel, with root nodules that fix nitrogen, and copious leaf litter provides a source of mulching material. Many areas of Papua New Guinea provide evidence of forest clearing over thousands of years. However, in at least two sites of considerable distance, Baliem Valley to the west and the Wahgi Valley approximately 500 miles to the east, Pollen studies of approximately 1,200 years ago indicate a surge of casuarina. This innovation probably occurred independently at these sites, and people still commonly transplant seedlings that have sprouted naturally along stream banks into silviculture sites on higher ground . Puncak Jaya, sometimes known by its former Dutch name Carstensz Pyramid, is a mist-covered limestone mountain peak 4,884 m above sea level. Another major habitat feature are the vast southern and northern lowlands. Stretching for hundreds of miles, these include lowland rainforests, extensive wetlands, savanna grasslands, and some of the largest expanses of mangrove forest in the world. The southern lowlands are the site of Lorentz National Park, also a UNESCO World Heritage Site. The Sepik, Mamberamo, Fly, and Digul rivers are the island's major river systems that drain in roughly northeast, northwest, southeast, and southwest directions respectively. Many of these rivers have broad areas of meander and result in large areas of lakes and freshwater swamps, with a few grassy plains in the lower areas around the rivers. In New Guinea are a high percentage of all the world’s ecosystem types: permanent equatorial glaciers, alpine tundra, savanna, montane and lowland rainforest, mangroves, wetlands, lake and river ecosystems, seagrasses, and some of the richest coral reefs on the planet. 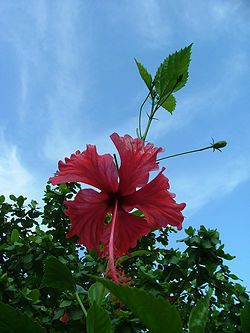 Bunga Sepatu/Hibiscus, New Guinea, photo 2003. The fauna of New Guinea comprises a large number of species of mammals, reptiles, birds, fish, invertebrates and amphibians. With some 800,000 km² of tropical land, New Guinea has an immense ecological value in terms of biodiversity, with between 5 to 10 percent of the total species on the planet, and of that, more than five percent of the world's species exists in less than one percent of its land area. This percentage is about the same amount as the United States or Australia. A high percentage of New Guinea's species are endemic, and thousands are still unknown to Western science: probably well over 200,000 species of insect, between 11,000 to 20,000 plant species; over 700 resident bird species, including most species of birds of paradise and bowerbirds, parrots, and cassowaries, 454 of which are only found in New Guinea; over 400 amphibians; 455 butterfly species, including the world's largest butterly - the Queen Alexandra Birdwing found in the Oro Province; marsupials including Bondegezou, Goodfellow's Tree-kangaroo, Huon Tree-kangaroo, Doria's Tree Kangaroo, Long-beaked Echidna, Tenkile, Agile Wallaby, Alpine Wallaby, cuscuses and possums; and various other mammal species. Most of these species are shared, at least in their origin, with the continent of Australia, which was until fairly recent geological times, part of the same landmass. The island is so large that it is considered 'nearly a continent' in terms of its biological distinctiveness. Biogeographically, New Guinea is part of Australasia rather than the Indomalayan realm, although New Guinea's flora has many more affinities with Asia than its fauna, which is overwhelmingly Australian. Botanically, New Guinea considered part of Malesia, a floristic region that extends from the Malay Peninsula across Indonesia to New Guinea and the East Melanesian Islands. The flora of New Guinea is a mixture of many tropical rainforest species with origins in Asia, together with typically Australasian flora. The island is famous for its many beautiful orchids. More than 3,000 species are unique to the country—over two thirds of the world's known species—and new varieties are still being discovered. In the low and sub-mountainous lands the flora is a mixture of Malayan, Australian and Polynesian forms. Typical southern hemisphere flora include the conifers Podocarpus and the rainforest emergents Araucaria and Agathis, as well as tree ferns and several species of Eucalyptus. New Guinea has 284 species, many nocturnal, and six orders of mammals: (monotremes (2 species), three orders of marsupials, rodents and bats); 195 of the mammal species (69 percent) are endemic. 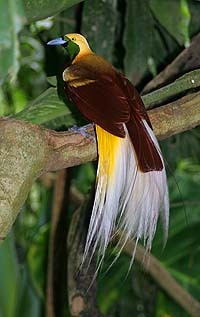 New Guinea has 578 species of breeding birds, of which 434 species are endemic. The island's frogs are one of the most poorly known vertebrate groups, currently totalling 282 species, but this number is expected to double or even triple when all species have been documented. About 330 sorts of amphibians and reptiles are already known, though it is believed to easily exceed 500 species. New Guinea has a rich diversity of coral life and 1,200 species of fish have been found. Also about 600 species of reef-building coral—the latter equal to 75 percent of the world’s known total. The entire coral area covers 45 million acres off a peninsula in northwest New Guinea. The immense diversity of ocean terrain includes barrier reefs, coral walls (drop-offs), coral gardens, patch reef, fringing reefs, seagrass beds and coral atolls. The first inhabitants of New Guinea arrived possibly as early as 50,000 years ago, having travelled through the south-east Asian peninsula. These first inhabitants, from whom the Papuan people are probably descended, developed one of the earliest known agricultures. Archaeologists have found evidence of ancient irrigation systems in the highlands. Early garden crops, many of which are indigenous, included sugarcane, Pacific bananas, yams, and taros, while sago and pandanus were two commonly exploited native forest crops. In more recent millennia another wave of people arrived on the shores of New Guinea. These were the Austronesian people, who had come from present–day Taiwan, through the south-east Asian archipelago, colonizing many of the islands on the way. These people had technology and skills extremely well adapted to ocean voyaging. Austronesian language–speaking people are present along much of the coastal areas and islands of New Guinea. Photo taken by U.S. soldier (Mr. Gentile) while serving in New Guinea during World War II. The first Europeans to sight the island were the Portuguese in 1511, however they made no landing until 1527. In 1526-27 Don Jorge de Meneses came upon the western tip of New Guinea and named it ilhas dos Papuas. The word papua is often said to derive from the Malay word papua or pua-pua, describing the frizzled quality of Melanesian hair. Another possible source of the name is the Biak phrase sup i papwa which means 'the land below [the sunset]' and refers to the islands west of the Bird's Head, as far as Halmahera. Whatever the origin of the name Papua, it came to be associated with this area, and more especially with Halmahera, which was known to the Portuguese by this name during the era of their colonization in this part of the world. In 1545 the Spaniard Iñigo Ortiz de Retez sailed along the north coast of New Guinea as far as the Mamberamo River near which he landed, naming the island 'Nueva Guinea' because he found a resemblance between the islands' inhabitants and those found on the African Guinea coast. The first map showing the whole island (as an island) was published in 1600 and shows it as "Nova Guinea." The first European claim occurred in 1828, when the Netherlands formally claimed the western half of the island as part of the Dutch East Indies. In 1883, following a short-lived French annexation occurred. In the 1870s Great Britain surveyed the southern coast. By 1884 they had annexed the southeastern quadrant. Within a year, Germany claimed the northeastern section. Due to the rugged terrain and isolated village communities, the impact of colonization varied throughout the island. In 1905 the British government renamed their territory Papua and in 1906 transferred total responsibility for it to a newly independant Australia. During World War I, Australian forces seized German New Guinea (Kaiser-Wilhelmsland), which in 1920 became a League of Nations mandated territory of Australia. The Australian territories became collectively known as The Territories of Papua and New Guinea (until February 1942 when invaded by Japanese forces). Prior to the early 1930s, most European maps showed the highlands as uninhabited forests; that area was only first "discovered" in 1933. On June 21, 1938, Richard Archbold discovered the Grand Valley of the Baliem River which had 50,000 yet-undiscovered Stone Age farmers living in orderly villages. The people, known as the Dani, were the last society of its size to make first contact with the western world . Netherlands New Guinea and the Australian territories were invaded in 1942 by the Japanese. The Australian territories were put under military administration and were known simply as New Guinea. The highlands, northern and eastern parts of the island became key battlefields in the South West Pacific Theatre of World War II. Papuans often gave vital assistance to the Allies, fighting alongside Australian troops, and carrying equipment and injured men across New Guinea. Following the return to civil administration, the Australian section was known as the Territory of Papua-New Guinea (1945-1949) and then as Papua and New Guinea, even though they were merged administratively. Although the rest of the Dutch East Indies achieved independence as Indonesia on December 27, 1949, the Netherlands regained control of western New Guinea and attempted to claim and gain West Papua as part of its nationhood. West New Guinea was under Dutch occupation from 1949 till 1962. During the 1950s the Dutch government began to prepare Netherlands New Guinea for full independence, which was granted limited home rule in 1951 from Australia. Elections began taking place in 1959 and the New Guinea Council took office on April 5, 1961. However, Indonesia threatened with an invasion, after full mobilization of its army, by August 15, 1962, after receiving military help from the Soviet Union. Under strong pressure of the United States government (under the Kennedy administration) the Dutch, who were prepared to resist an Indonesian attack, attended diplomatic talks. On October 1, 1962, the Dutch handed over the territory to a temporary United Nations administration (UNTEA - United Nations Temporary Executive Authority). On May 1, 1963, Indonesia took control and the West Papuan Council was disbanded. The territory was renamed West Irian and then Irian Jaya. In 1969 Indonesia, under the 1962 New York Agreement, was required to organize a plebiscite to seek the consent of the Papuans for Indonesian rule. The Act of Free Choice resulted, however, due to military intimidation the vote was 100 percent in favor of continued Indonesian rule. Elections in 1972 resulted in the formation of a ministry headed by Chief Minister Michael Somare, who pledged to lead the country to self-government and then to independence. Papua New Guinea became self-governing in December 1973 and achieved independence from Great Britain on September 16, 1975. In 2000, amid increasing discontent and opposition to Indonesian rule, Irian Jaya was formally renamed "The Province of Papua" and a large measure of "special autonomy" was granted in 2001, which was however, never implemented. At the beginning of 2003, Indonesian President Megawati Sukarnoputri announced the division of the province into three parts (West Irian Jaya, Central Irian Jaya and Irian Jaya), while the name "Papua" for the province would again revert to Irian. With strong public protest by Papuans, only the province of West Irian Jaya was split from Papua Province. In 2005 a new proposal came from Jakarta to split the province into five provinces. This plan has not yet been implemented. West Irian Jaya (Irian Jaya Barat) with Manokwari as its capital. The province changed its name to West Papua in February 2007. The new name applies from February 7, 2007, but a plenary session of the provincial legislative council is required to legalize the name, and the government needs to then issue a regulation. Papua (formerly Irian Jaya until 2002) with the city of Jayapura as its capital. A proposal to split this province into Central Papua (Papua Tengah) and East Papua (Papua Timur) has not been implemented. The eastern part forms the mainland of Papua New Guinea, which has been an independent country since 1975. It was formerly a territory governed by Australia. Kurulu Village War Chief, Baliem Valley, Papua, October 2006. Many believe human habitation on the island has been dated to as early as approximately 40,000 and possibly 60,000 years B.C.E. The known population of New Guinea is approximately 6.9 million people. However, large areas of the island remain unexplored, rendering it impossible to calculate the number of inhabitants other than an approximation. 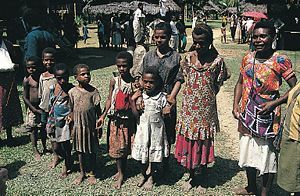 Current evidence indicates that the Papuans (who constitute the majority of the island's peoples) are descended from the earliest human inhabitants of New Guinea and are found here in their greatest racial purity and occupy practically the whole island except its eastern extremity. These original inhabitants first arrived in New Guinea at a time when the island was connected to the Australian continent via a land bridge, forming the landmass known as Sahul. These peoples had made the sea-crossing from the islands of Wallacea and Sundaland (the present Malay Archipelago) by at least 40,000 years ago. The ancestral Austronesian peoples are believed to have arrived considerably later, approximately 3,500 years ago, bringing the Southeastern Asia cultural traditions, as part of a gradual seafaring migration from Southeast Asia, possibly originating in eastern China. Austronesian-speaking peoples colonized many of the offshore islands to the north and east of New Guinea, such as New Ireland and New Britain (two islands that dominate a group called the Bismarck Archipelago), with settlements also on the coastal fringes of the main island in places. The island is presently populated by very nearly a thousand different tribal groups and 700 hundred known languages. Indonesian is the official language of Indonesia while English is the official language of Papua New Guinea. English is spoken by the educated throughout the island as well as in Milne Bay Province, while Melanesian Pidgin serves as the lingua franca. Many of the islands, as well as the northern and eastern coasts have communities of speakers of Austronesian (Melanesian) languages. Several pidgins, such as Tok Pisin and Hiri Motu, are widely spoken. There are also people of Polynesian, Chinese and Europeans background who speak in their native tongues. The overall population density is low, although pockets of overpopulation exist. Papua New Guinea's Western Province averages one person per square kilometer (3 per sq. mi.). 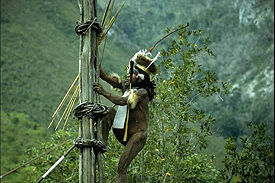 The Chimbu Province in the New Guinea highlands averages 20 persons per square kilometer (60 per sq. mi.) and has areas containing up to 200 people farming a square kilometer of land. The highlands are home to 40 percent of the population. Most of the population are subsistence farmers. Yams, sago, taro, and bananas are the lowland staple foods, and the sweet potato is the main highland food. Agriculture is supplemented by hunting and gathering. Pig husbandry is widespread, which includes Pig-based trade between the groups and pig-based feasts are a common theme with the other peoples of southeast Asia and Oceania. The island's cash crops include palm oil, tea, coffee, cacao, and rubber. The forests prove timber for export while the sea provides tuna and prawns. 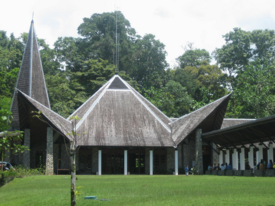 Although about a third of Papua New Guinea's population is Roman Catholic and more than a quarter are Lutherans, traditional religious beliefs and rituals are still widely practiced, and most of the island's population is animist. ↑ Puncak Jaya, Indonesia, Peakbagger. Retrieved May 30, 2007. ↑ Jared Diamond, The Third Chimpanzee, (Harper Collins, 1993). ↑ Infoplease.com. Papua New Guinea History, Retrieved May 29, 2007. April 12, 2007. New Guinea. Love to Know. Based on 1911 Columbia Encyclopedia. Retrieved June 29, 2007. Papua Expedition. New Guinea at a glance. Retrieved June 29, 2007. Mary Altier. Papua New Guinea's beauty, danger. Papua New Guinea. Retrieved June 29, 2007. Papua (New Guinea) Tours & Expeditions. 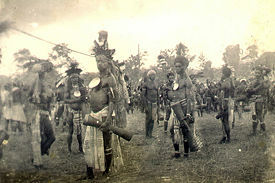 Papua (Indonesia) – Primitive Tribes – Today canibals. Retrieved June 29, 2007. Ploeg, Anton. ‘DE PAPOEA’ What’s in a name?. Retrieved June 29, 2007. Pub Quiz Help. Largest Islands. Retrieved June 29, 2007. Taylor, Paul Michael. Western New Guinea: The Geographical and Ethnographic Context of the 1926 Dutch and American Expedition. Retrieved June 29, 2007. U.S. Department of State. April 2007. Background Note: Papua New Guinea. Retrieved June 29, 2007. Heijden, Peter van der. History of Netherlands New Guinea. Peter van der Heijden a web site. Retrieved June 29, 2007. Wallace, Sir Alfred Russell. Welcome to Papua New Guinea. World Wildlife Foundation. Retrieved June 29, 2007. Chappell, John; John Muke, and David Price, December 4, 1986. A 40,000 year-old human occupation site at Huon Peninsula, Papua New Guinea. Nature Publishing Group. Retrieved June 29, 2007. Columbia Encyclopedia information about New Guinea. The Columbia Electronic Encyclopedia. Sixth Edition, Columbia University Press, 2003. Mackay, Roy D., and Eric Lindgren. New Guinea. Amsterdam: Time-Life Books, 1976. Mead, Margaret. Growing up in New Guinea; a comparative study of primitive education. [New York]: Morrow, 1962. Collingridge, George. The Discovery of New Guinea. PapuaWeb Project. This page was last modified on 20 November 2018, at 15:54.